We walked into town this morning, but it was quite an effort with all the snow. Our Saturday routine involves going to the library and then picking up the fresh groceries we need. Sometimes the library sells off old books – they never charge very much, usually 50p or £1. 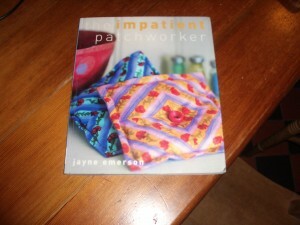 I found a book on patchwor this morning for 50p. It’s got lots of small scale projects in it, and as it looks as if I’m going to be spending quite a bit of time in the house this week, it will give me something to do with the odd scraps of material we have got lying aroud. I’ve had to change my plans quite a bit for this week – originally I was going to do the garden and have a huge clear out, taking loads of stuff to the recycling centre. I still want to have a clear out, but with 2 feet of snow on the road, my trip is likely to be postponed for a few days. Does your local library sell off books? What has been your best find?